On Friday, April 6, 1956, fourteen years after its founding in 1942, Capitol Records celebrated the grand opening of its new, state-of-the-art, centralized headquarters at Hollywood Boulevard and Vine Street. As searchlights crisscrossed the LA sky, Capitol and E.M.I. executives gathered to show off their new corporate headquarters. 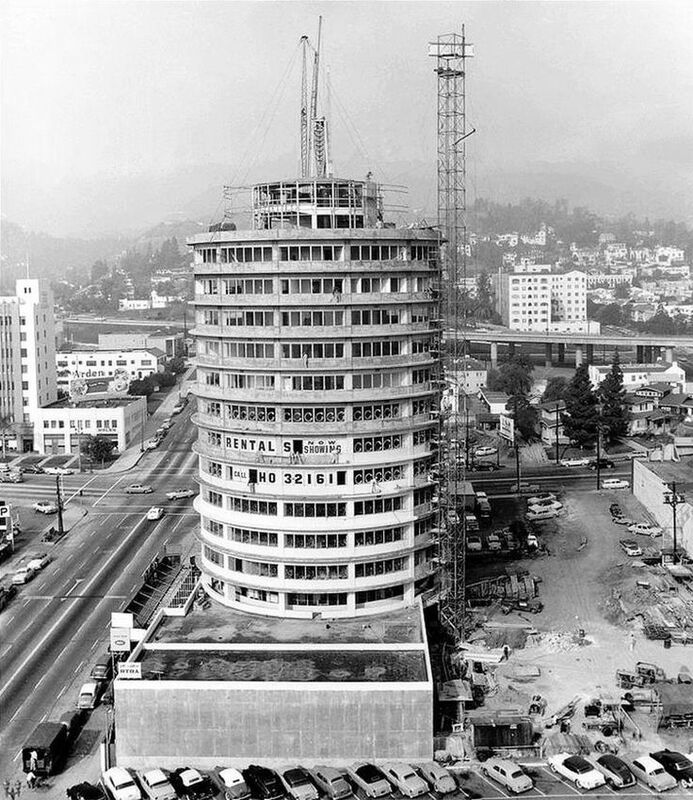 The Capitol Tower, now a worldwide symbol of Hollywood and the music industry, was built by the architectural firm Welton Becket & Associates, and designed by Lou Naidorf. Welton Becket was born August 8, 1902, in Seattle and studied at the University of Washington. He became one of Los Angeles’ most influential architects. 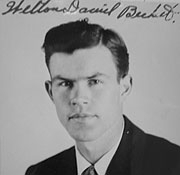 In 1933, Becket came to LA and, eventually, formed Welton Becket & Associates. 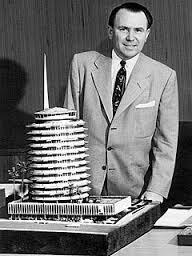 He designed the UCLA Medical Center, the Prudential Building in LA, the Santa Monica Civic Auditorium, the factory and offices of the Hallmark Company in Kansas City, Missouri, and Hilton Hotels in Beverly Hills, Cairo, Egypt, and Havana, Cuba. At a cost of $2 million, the 93,000 square foot Tower is a concrete and glass cylinder supported by two central columns. It has thirteen floors and rises 150 feet from the ground to the upper roof, the maximum height then permitted by LA County code. The circular construction began on the second floor which is seventy eight feet in diameter. The third and successive floors are ninety feet in diameter giving the illusion the tower is suspended in space. Employees could eat lunch on the roof top terrace while enjoying the spectacular view of the city. Jutting from the roof is a ninety two foot spire whose tip was a red beacon light that flashed the word “Hollywood” in Morse code every night (see video). Leila Morse, the inventor’s granddaughter lived nearby and was invited to pull the switch activating the beacon. The core of the building contains the elevators, washrooms, closets, and corridors. The design had some inherent energy saving qualities, operational ergonomics, and was one of the first large fan coil projects in the area. The reduced ratio of exterior wall surface to inner functional space lowered construction and air conditioning costs. For Capitol executives, one tangible advantage was that everyone would have a window office. The April 6 celebration was by invitation only. Attendees gathered in the marble foyer and were greeted by a cheery Capitol employee who escorted them in small groups into one of two Otis elevators (a third elevator was not operational yet) to the Executive Floor which, since Becket was apparently not superstitious, was actually the 13th floor. Getting off the elevator, you stepped onto carpet, turned right, and toured the offices where a young Voyle Gilmore worked as one of five A&R men. And, conveniently, the A&R men were all men. Each office had piped in music. “Our own, of course,” joked Wallichs. Then you strolled through the Artist’s Lounge where Frank Sinatra might occasionally wait, but only momentarily, to see Wallichs. The wood paneling in the executive area was actually Flexwood, a wood veneer on a fabric backing fastened to the wall like wallpaper. However, the cabinets in the executive offices were real wood and, concealed behind sliding doors in the lower half, contained a state-of-the-art turntable and amplifier. The speaker was in the upper right corner of the cabinet. You then proceeded to National Sales and Operations, the Legal Department, and the Library on the 12th floor. Next up was Merchandising on eleven, Accounting on ten, and Tabulating on nine. The ninth floor was also home to the Photographic Studio and dark room. Capitol took pride in pointing out that the dazzling white floor tiles in the photo studio were made of vinyl-asbestos. Floors eight through four were unoccupied at the time and slated for future tenants. The highlight of the third floor was the Review Room, complete with sound insulated walls, where records were tested under “simulated living room conditions.” The second floor was home to Purchasing, Advertising, and Personnel. Capitol saved the best for last. The tour took the back stairs to the first floor where guests toured the Recording Room (Lacquer Cutting), Recording Equipment Storage, Tape Master Storage, Tape Editing Rooms, and Shipping and Receiving. From there, you were led through Studio C, the Mezzanine Lounge, and Studio B for a High Fidelity demonstration. The tour wrapped up in Studio A where, after enjoying a light refreshment, you were given a souvenir record and booklet, and exited through the back door. “The Capitol Record, a souvenir of the Capitol Tower” came in a cardboard sleeve with a cut-out photograph of the new building on the cover. On the back cover were two black and white photographs showing Wallichs and Alan Livingston, Capitol’s executive vice president, “in one of the ultra-modern recording studios” and Frank Sinatra conducting a fifty-six piece orchestra in the Tower’s first recording session. Great article, enjoyed reading this! I don’t think I’ve ever seen one of those grand opening promo records for sale anywhere. Wgo’s got em? I am glad you enjoyed the article on the Capitol Tower. The design and construction of this iconic LA landmark makes a fascinating story. I picked up that Capitol promo record a number of years back and you’re right, you don’t see it pop up too often. I wonder how many were pressed, how many were distributed, and how many survived.